Swimmers at start, and many other fab shots from the talented (and knowledgeable) Ed Dutchmazz. 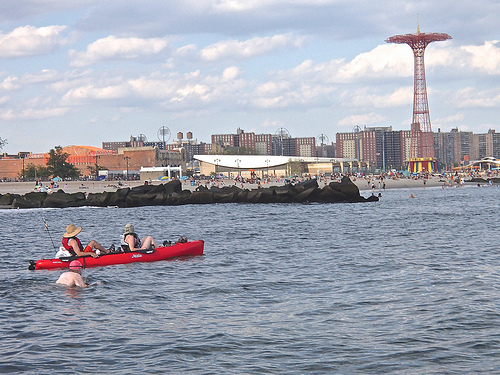 Some great photos from “Princess Polar Bear” Capri, including Alan approaching Coney Island. Great pics of the day, including the finish, from Mario Berger…love the color! Congratulations to the 2013 Rose Pitonof Swim Swimmers! Rose reached the Williamsburg Bridge almost 2 hours after her start. Our Swimmers got there in less than half that time. Rose experienced her first push from an ebb tide 3 hours into her swim, right around the Brooklyn Bridge. For our Swimmers, the current was definitely in their favor at around 2 hours into their swim, at the Brooklyn Bridge. 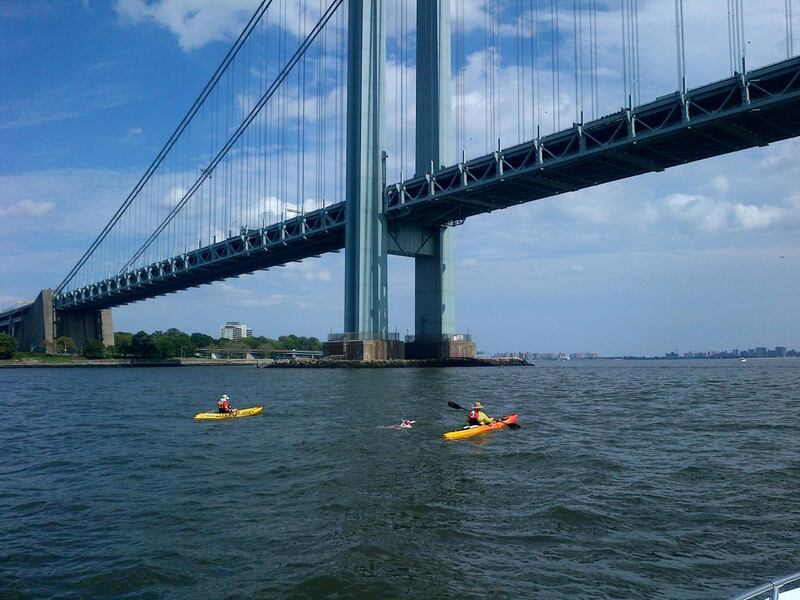 Rose swam out toward Staten Island to catch the best current mid channel, as our Swimmers did. As Rose turned into the final stretch of her Swim, the tide changed and she spent 1hr 40min swimming the final mile against the current. Our Swimmers experienced a fairly strong current in their favor right up to the pier. “To learn the breast stroke, lie comfortably in the water, so that feet are only a few inches below it and mouth just under the surface. Place legs together straight out, arms extended in from, hands touching, fingers closed, and palms down. Join us on August 10th 2013 for the fourth annual Rose Pitonof Swim! Swimmer Registration and Volunteer Sign Up are now open. Congratulations to our 2012 Rose Pitonof Swimmers! Join us at 9:30 AM on Saturday August 18, 2012 for our third annual Rose Pitonof Swim. Video coverage of Swim from Ed Dutchmazz, including great footage of Lori, Cara, and Alan coming ashore. Photos from Maureen Donaghy, kicking it off with a swath of pink fabric. Great flickr set from “Princess Polar Bear” Capri Djatiasmoro. Photo of JC, Parachute Jump, and Pier from Terry O’Malley as JC closes in on the finish line. Another great flickr set from JP Reardon. Aline Dolan got some pics at the beach and at Ruby’s. Nicole Mermet took some great shots of the day. Cat Mardis’ shots from Cara’s pink boat. Will post more updates shortly…please feel free to add your own links! So strong, fast…such a fantastic celebration! 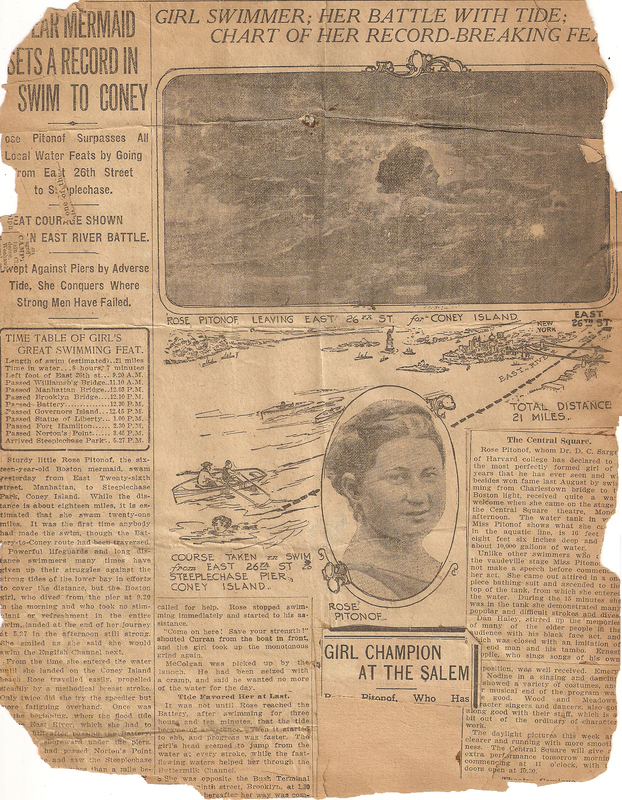 On Sunday Aug 13th 1911, to clear all doubt from the most skeptical & to show the world that Championship Timber is certainly in her makeup, she eclipsed her own grand & unparrelled record of 1910 by swimming from Bellvue Pier, E 26th St. to Steeple Chase Park Coney Island, distance 25 miles, time 8 hours and 7 minutes, a swim some experts declared could never be accomplished by anybody. They said the writer was mad, to let a little girl attempt to swim a distance of 25 miles, they offered to pay all the writer’s expenses to call it off. That it would be the means of killing her, and in the next place nobody living could accomplish such a distance. The Ametuer & Professional Swimming Clubs of NY sent the writer letters by mail, saying it would be a crime to let her attempt it. Their letters were answered in the following tone, Gentlemen, if you can spare the time on morning of the 13th, come & see her win out. If you cannot come, than watch the morning papers of 14th. 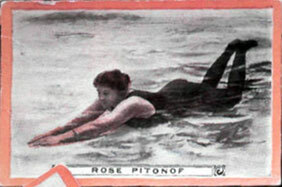 On the never to be forgotten Sunday August 13th, 1911, Miss Rose Pitonof, Champion Swimmer of the World, and one of the bravest that ever plunged in the briny, appeared at the starting point which was Bellvue Pier, foot of E 26th St. accompanyed by her father, Mr Eli Pitonof, her brother, Adolph, members of the press, refferees, time keepers, invited guests and coach who escorted her the entire journey & precisely at 9:20 A.M. started on her greatest of all endurance swims of 25 miles to Steeple Chase Coney Island. 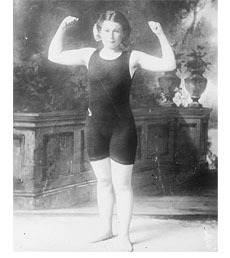 Think of it why you would hardly believe your eyes, this brave little school girl, accomplishing a mark in long distance swimming, that set two hemispheres in awe & wonder, a swim that was attempted no less than a dozen times by other famous world wide professional & ametuers without success. She reached her goal, after making one of the gamest struggles ever witnessed in this or any other part of the world, swimming against the wicked flood tide of the East River, for 2 1/2 hours out of the 8 hours she was in the water, without taking nourishment of any kind, not even a teaspoon of water. she went on with grim determination, & the pluck of a lion, to reach her goal which was Steeple Chase Pier Coney Island, which she did with the greatest reception ever tendered a titled grown head, and was received by upwards of 100,000 people, who in their frenzy to have a look at this wonderfuly little girl, nearly turned into a mob riot. The very boat that guided her, in this her greatest of all record swims was dismantled by this infuriated mob of enthusiastic humanity. For souvenirs they took possession of the seats, oars, & oar locks, to take home for rememberance of the Greatest Endurance Swim of the 20th Century.